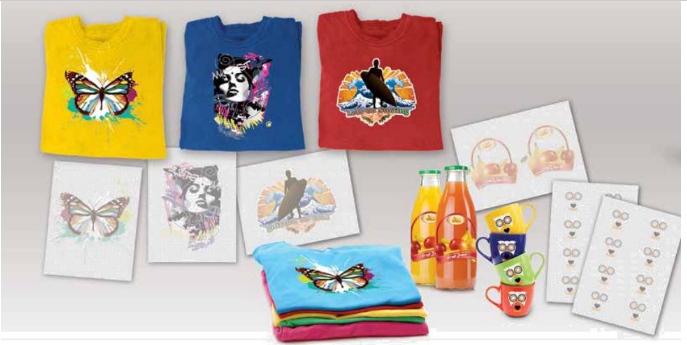 The great advantage of laser transfer paper is that using the same laser printer you use to print paper and ink original can also print shirts and other textiles. You simply have to select the proper transfer paper, print on your printer and iron it with a transfer iron following directions. The advantages are clear: the initial investment is very low, because you take advantage of your home printer / office. With white laser printers toner has developed a type of laser transfer paper is called "no-cut" , which means you do not need trimming. The big difference in the use of paper is printed only the design but not the unprinted paper background transfers. It Is a breakthrough and competitive advantage which is dedicated to customizing shirts. You can get a similar effect direct printing without having to invest in a specialized and expensive equipment. This type of paper provides good results with vector images, without transparency and shadows . Bear in mind the background color of the shirt and the type of printer you have (white toner or CMYK) because this will also determine the type of shirts you can create. If you are using an OKI printer with white toner ,you must be sure to set the density of the white toner to -3 . The toner function is to provide opacity to make the colors stand out on a black shirt. Although initially you may think that the greater amount of white toner, get better transfer, this conclusion is wrong. Why? The white toner requires a higher fixing temperature that CMY toners for this reason, the lower the density of the target, get better adhesion of the design. In addition , the lower density, the smoother the transfer applied to the shirt. The manufacturer provides the application instructions you should always follow to the letter. However, you must understand that the transfer plates are not all the same and it is possible that adjustments in temperature or pressure provided by the manufacturer, have to be modified slightly to suit the performance of your iron transfer. You must perform tests with your team to determine the best fit. Although the manufacturer provides the instructions, the skill and experience of the operator is also a key factor in this technique. Indications of low pressure, also depends on a personal opinion . If the application instructions indicate that you should separate the paper with a smooth and rapid movement they are also subjective criteria that depend on the appreciation of the operator. Our recommendation is to experiment with the application of this type of laser transfer paper before offering this technique to your customers. You may get a good result at first, but you may have to experiment and slightly modify the method of application until the method that works best for you. We sell these laser transfer paper in packs of 50 sheets, so you can buy a small amount and make your own tests. This post makes perfect sense with your contribution so if you have experience in the use of this paper, write to tell us about what kind of images you use with no -cut laser transfer paper ?